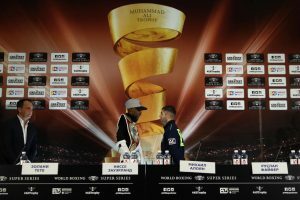 After last weekend’s fights in Yokohama, the World Boxing Super Series for the bantamweights and super-lightweights is well underway. Naoya Inoue and Kiryl Relikh, progressed through to their respective weight-class tournaments and this weekend in Ekaterinburg, Russia the second bantamweight quarter-final between WBO champion, Zolani Tete and Russian, Mikhail Aloyan takes place for the right to face either WBA champ, Ryan Burnett or Nonito Donaire at the semi-final stage. Tete, the South African responsible for the quickest knockout in world title fight history (11-second wipe-out of Siboniso Gonya) shot himself into the wider audience’s view after he defended his IBF super-flyweight title for the first time, against Paul Butler, stopping the challenger in eight rounds. Zolani decided against chasing unification, opting to have two homecoming bouts, returning to England 12 months on from the Butler win, and seek out the best at bantamweight. He would eventually achieve his aim of becoming a two-weight world champion after that same record-breaking Gonya KO meant Tete became the new WBO world champion, putting the rest of the division on notice. ‘‘As a world champion you need to adjust and adapt in each and every style that a boxer brings…Aloyan is one of the best fighters in the Super Series. I believe it’s going to be a good fight and definitely I’m gonna take him out…Whatever he is bringing, it won’t have any place to stay. Tete’s opponent on Saturday night has an interesting history. Born in Armenia but raised and fought for Russia in the amateurs, Mikhail Aloyan, 4-0 (0KOs), was an outstanding amateur picking up gold medals in the 2009 & 2016 World Championships. Aloyan briefly added the 2016 Olympic silver medal until tests came back positive for the stimulant, Tuaminoheptane and the Court of Arbitration of Sports ruled on stripping the silver from Mikhail. Though the Russian maintains his innocence, he hasn’t let it affect his acceleration through the early stages of his pro career. Also a southpaw, the 2012 Olympic bronze medallist has fought twice as at super-fly and twice at bantamweight, winning minor titles in both divisions. The combined record of his last three opponents is 46-1-2 (19KOs) and curiously, all four have so far all been from Nicaragua. ‘‘The fact that this fight takes place in Ekaterinburg, means we have an opportunity to bring out the best of our performance. The second season of the WBSS cruiserweights also gets going at the Ekaterinburg Expo, as unbeaten, American prospect, Andrew Tabiti steps into the ring with fellow undefeated fighter, Ruslan Fayfer, 23-0 (16KOs). Tabiti, 16-0 (13KOs) was last seen sharing the ring with career-heavyweight, Lateef Kayode. An opponent ‘The Beast’ dispatched with inside 5 rounds with a precision right hand uppercut. It put to bed any demons left behind Tabiti’s controversial decision victory over cruiserweight veteran, Steve Cunningham on the Mayweather/McGregor undercard last year. ‘‘I’m coming to this man’s country and take what he has. I’m on my A-game, I hope he’s on his A-game. It doesn’t matter how many fights he’s had; the quality of opponent is not anything for me to be afraid of. ‘‘The fact I have more fights than my opponent does give me the ground to say I do have more experience than him…I am not going to reveal anything, I will show everything during the fight. Saturday night’s winner of the cruiserweight showdown will fight either Yunier Dorticos or Mateusz Masternak.